Just as a painter can create visual images through his brush and a poet can string couplets through his pen, a dancer can dream with his feet. It is not merely a demonstration but the innovative conversation which links the audiences with his performances that adds an authentic flavour to his pieces. Even while chatting he demonstrates the sheer ecstasy of dancing, exploiting every curve of the body as a vehicle of emotion and zest. His style is distinct and one he had developed by looking beyond the boundaries of Western classical dancing and stereotyped local dance techniques. “I highlight Sri Lankan culture through the productions but this does not mean that I am stuck in traditions and is not open to change. Dance is an art which reaches out to the audience beyond borders physically and culturally. It is a time-consuming task which demands a lot of dedication and training,” says nATANDA Dance Theatre founder and artistic director Kapila Palihawadana. 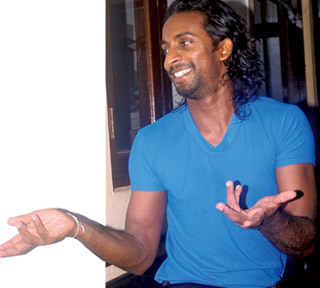 He has a number of successful productions to his name: Frangipani, Betodiaf, Issuki, Modaborn, Mokabalo, Ravens and Signspeak, which have been showcased in Sri Lankan and foreign shores. ‘Ravens’ was among the five finalists at the International Competition of Choreography Plan for Asian Dance Productions conducted in Korea. It was selected out of 16 countries and 65 choreographies. Noted for his exceptional talents the Goethe Institut awarded Kapila with a scholarship to engage full time in dancing and choreography. He is working on his latest project, one that deals with a much emphasized topic – water conservation. Titled ‘Ripples One’, the production is set to unfurl at the Open Air Theatre, Vihara Maha Devi Park, from March 22 to 24. Q: How was the idea of making the ‘Ripples’ project born? A: It was the result of me having to undergo a few days without water. I realized how difficult life is if you did not have water at hand. It is one of the most essential needs for living things. I did a lot of research on the topic and our team travelled to different areas around the island including Anuradhapura. We spoke to the residents near Tissa Wewa. It had not rained for a long time and they told us that it was the first time that the tank had nearly dried out. The ground was cracked due to dearth of water. Water is associated with contrasting emotions. You find feelings such as pleasure, love, and comfort associated with it. Even the earth suffers when there is dearth of water. Then there is the other side of the story which presents the disruptive aspect of water. You get natural disasters like the tsunami and floods which brings a sense of disruption and violence. ‘Ripples One’ is choreographed to represent all these emotions. Ever since nATANDA began the project, we have realized the immense value of water. It had made us very sensitive to the topic. We spent a day collecting more than 100 plastic bottles that had been dumped in Tissa Wewa. Once the villagers witnessed our work they too began to feel a certain responsibility towards water preservation. Q: So the ‘Ripples’ project is more than just a choreographic dance piece? dance performances. Dancers and school children are welcome to take part in the items to become familiar with the water rituals and marine life. People do not know the value of water till they are deprived of having access to it. That is why they engage in actions which pollute and destroy this valuable resource. Our message is simple but very strong. Our campaign will be a wake up call to understand the value of water conservation. We invite all those who are interested to join hands with us. Q: Does the title ‘Ripples One’ suggest that there will be a sequel? A: As a choreographer and artiste I felt that there are so many different types of dance productions that you can do once you touch this theme. I have a lot of material coming for my creation. I also have to be very limited with my time since people are not interested in watching seven or eight-hour productions. The more I work on the production, the more I understand the value of it. I feel that the dancers can deal with totally different areas in the production. So yes, we have decided to do a second ‘Ripples’ in 2013. The costumes will be very simple for ‘Ripples One’ but ’Ripples Two’, for the moment, will most likely involve day to day costumes. We make the dance as a part of society. Not only is it a beautiful element, but it is also a part of the human being. It will probably be an open stage presentation and maybe we will go to locations like the train station and do different types of awareness programmes. It will be mostly about how you involve the audience into the dance production. ‘Ripples One’ too is an interaction between the artistes and the audience but it is in a more sophisticated manner. Shantha Dissanayake Memorial Foundation, Ratnapura, is involved in the project. There are a lot of teenagers who do not have enough facilities to come to the city and showcase their talents. We are going to invite them to come to Colombo and perform with ‘Ripples’. Sithija Ananda coordinates this project from Ratnapura and he will be bringing 100 teenagers from the area to take part in the programme with nATANDA. Q: Unlike other choreographers you do not use overly embellished outfits, intricate accessories or heavy make up on your dancers. A: Yes. That is because my ensemble comprises dancers, not models. Dancers should communicate through their bodies and movements. Wearing such ornaments distracts the audience from the performance. Costumes are important, but they should be limited to serve the purpose of bringing out the best in the dancer. A dancer should be as light as possible because it is only then that they can show the best of their talents. My dancers are very minimalist in their clothing and makeup. Some say that I try to expose cleavage through the costumes, but there is no such intention. My interest lies in the fact that my dancers can wear a costume in which they feel free to move in. Q: Your productions demand a lot of research and knowledge of the topic from the dancers. A: 'Ravens' was based on the myth of the crow which is a powerful bird. People usually do not think that you could create a dance piece through a bird. When you go deep into the theme of the production, you get to know so many interesting stories: myth, the scientific angle, the psychological part and physical elements. We learn new things everyday. nATANDA had become almost like a part of a university programme because the dancers have to come up with a part of the research. That experience push us to make really productive pieces. It is very honest and hard work which had paid off over the years. One such instance is to become one of the best five in Asia out of 60 dance choreographies. It is an amazing achievement. I think this is the first time, according to my knowledge, that something came up in Sri Lanka in the contemporary context. Q: How do you evaluate the response to your performances? A: A majority of my audiences are foreigners. They absolutely admire the unique style of dancing which we present. They appreciate our portrayals of the culture and our styles of expression. The Sri Lankan audience are used to the common perception of dancing. They were not very open to change when we started off some years back but now the local crowd is gradually taking interest and starting to enjoy our style of dancing.